Situated in Chomelix, this property provides self-catering wooden caravans, a vegetable garden and a farm with cows and ducks. Free cooking lessons are proposed by the owner and free private parking is provided. All of the wooden caravans include garden furniture, a fully equipped kitchen and a dining area. A private bathroom with shower, toilet and free toiletries is also available. Local specialties with farm products and homegrown vegetables can be requested at Les Roulottes de la Ferme des Chanaux. You can go fishing on the nearby rivers or have a walk in the surroundings. Le Puy en Velay is 30 km away and La Chaise Dieu is 16 km from Les Roulottes de la Ferme des Chanaux. Please note that a EUR 10 end-of-stay cleaning fee is not included in the price. You can choose to pay the fee or clean the accommodation yourself. 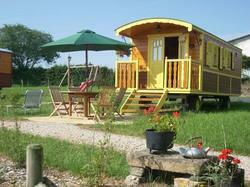 Wooden caravan with garden furniture, a fully equipped kitchen and a dining area. A private bathroom with shower, toilet and free toiletries is also available. Linen and towels are provided.